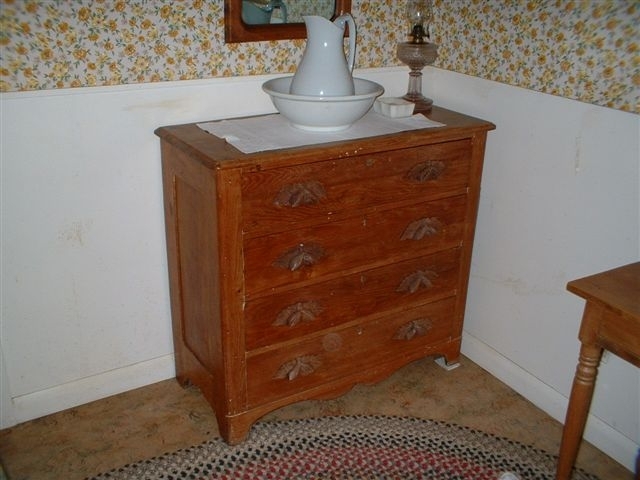 A chest of drawers that might have been in Rose Birnie’s house in 1850. It is part of the exhibit that presently inhabits the old house. Rose Birnie was James Birnie’s younger sister. 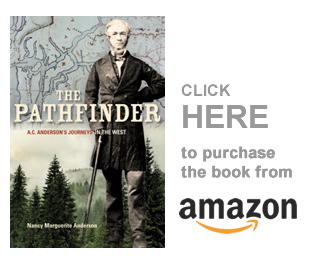 She lived most of her life in Aberdeen, Scotland, but joined her brother at Cathlamet, Washington Territory, to act as teacher for his children and for the children of Alexander Caulfield Anderson, who had settled nearby. Her full name was Barbara Rose Birnie, and she was born in Aberdeen in October 1801. Her baptism date at St. Nicholas church was October 29th, and her parents were Robert Birnie (1765-1829) and Elizabeth Dyce (1770-1826). I don’t know much of her early life, but I had always believed she stayed unmarried to look after her parents. Obviously, this is not true. She must have been either married, or employed, perhaps as a school-teacher or a nanny. But it seems she had little money, and in the late 1840’s her brother, James Birnie, encouraged her to come to Washington Territory to be a school-teacher for his children. He had left the Hudson’s Bay Company’s employment in 1846, and was now making good money in his store-keeping business. So Rose Birnie was fifty years old when she emigrated to North America, sailing on the HBC’s London ship, Norman Morison. Let me tell you a little about that historic ship: this information comes from Bruce McIntyre Watson’s Lives Lived West of the Divide. The Norman Morison was a barque of 564 tons, 119 feet in length and 27 feet in breadth. She was built of teak, in Burma, in 1846. She made five voyages to Fort Victoria from London, bringing colonists to the new Colony of Vancouver’s Island. On her first voyage she departed Gravesend [England] in October 1849, and arrived at Fort Victoria in March 1850. On her second voyage she left Gravesend in May 1851, and arrived at Fort Victoria at the end of October 1851. This second voyage of the Norman Morison was the voyage that carried Rose Birnie to Fort Victoria in 1851. On the morning of November 27th I was about on the plains on business, the Steamer Beaver & Brigantine Mary Dare arrived at Nisqually, and the Chief Factor [John] Work, with part of his family, and Miss Birnie, passenger from England in the Norman Morison, landed and spent the night at the Fort — next day, as soon as the Steamer was wooded, both vessels proceeded to the port of entry (Olympia), Mr. Work & myself being on board the Steamer, Miss Birnie, Mrs. Work and the children remaining on shore they having merely landed from the Steamer a change of wearing apparel. [B.223/b/9, HBCA]. I have to advise you that Miss Birnie who came out as passenger by the Company’s ship Norman Morison from England has not yet paid for her passage out. It appears from Mr. [Archibald] Barclay’s letter that she was provided with a cabin passage for which she was to pay 50 pounds on her arrival in the country. Will you have the goodness to collect the money from the lady or her brother, Mr. James Birnie, and place it to proper account. We presume by this that Rose Birnie did not have any money, and that her brother paid for her passage. She took over the job of schooling the Birnie children. This didn’t last long, for in spite of her age she was an eligible woman in a society filled with men. She married George Barber Roberts, who was then clerk and manager of the Cowlitz Farm west of Fort Vancouver and south of Fort Nisqually. Interestingly, Roberts had acted as schoolteacher at Fort Vancouver for a year or so, many years earlier. In 1842-1843 he returned to England and married his cousin, Martha Crabbe, rejoining the HBC and bringing his new wife to the Cowlitz Farm. Martha died in childbirth in 1850, and he then married Rose and moved to Cathlamet, where James Birnie built a house for them. Rose died in 1880 and is probably buried in the historic grave-yard at Cathlamet; George died three years later. The house that James Birnie built for them still stands, and is a sort of private museum dedicated to the Birnie family. It is always fun to write these posts. I hadn’t known that Rose was Roberts’s second wife and for a moment I thought he was a bigamist. I am glad he was not. In Cathlamet George and Rose’s lives would have been quiet, unlike life elsewhere in the territory where American settlers were trying to edge the HBC men off their lands and farms. I hope Rose was happy, and I think she was, for the most part.